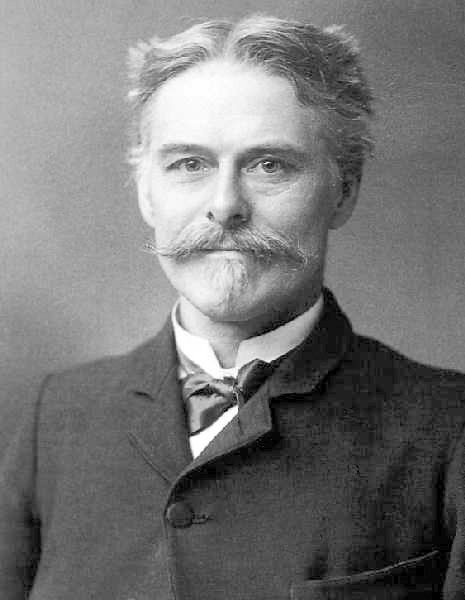 In 1870, renowned paleontologist Edward Drinker Cope published a description of a newly discovered giant plesiosaur (an extinct aquatic reptile that a reader less informed than you might mistakenly refer to as a dinosaur). Unfortunately, he’d failed to place the head on the right part of the body, sticking the skull to the end of the creature’s long tail. 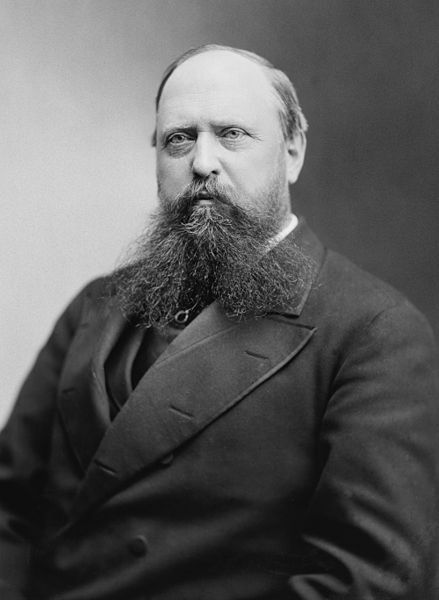 Surely after a while, Cope would have figured out his mistake, but he didn’t manage to do so before renowned paleontologist Othniel Charles Marsh (the judgment of whose parents I have to question because they named their kid “Othniel”) gleefully pointed out the mistake for the world to see. The two men weren’t on great terms to begin with, as rumors circulated that Marsh had once paid Cope’s field crew to send anything they found to Marsh instead. Once insult was added to injury, the great Bone Wars began, with two of the most prominent paleontologists in North America behaving like squabbling children. The rivalry raged for twenty years resulting in great advances in the field, which before this period had discovered only eighteen dinosaur species on the continent. Between the two men, they described and named over 130 new species of dinosaur. But as beneficial as it may have been, this feverish pace of scientific discovery had some drawbacks, too. The paleontologists’ dig teams were known to spy on each other, steal fossils from one another, vandalize one another’s dig sites, or even dynamite their own to keep anyone else from digging there. And then there were the mistakes of the men themselves that occasionally found their way into work that was rushed to publication. Marsh “won” the bone wars, discovering about eighty North American dinosaurs to Cope’s fifty between the years of 1870 and 1890, but had the two men lived so long, Cope might have gotten the last laugh. In 1877, Marsh described a long-necked herbivorous dinosaur he called Apatosaurus. Just two years later, he unearthed another long-necked dino he called Brontosaurus. Trouble is that in 1903, paleontologist Elmer Riggs determined Apatosaurus and Brontosaurus were really the same species. I imagine Cope was laughing in Heaven. Because life isn’t fair, and sometimes parents decide to name their son Othniel, the earlier name had precedent. And so, since the year 1903, there has been no such thing as a brontosaurus. No friendly leaf-eating, lumbering, earth-shaking, and, let’s face it, small-brained brontosaurs. And despite what you may have learned from the Flintstones, no brontosaurus burgers or brontosaurus ribs either. 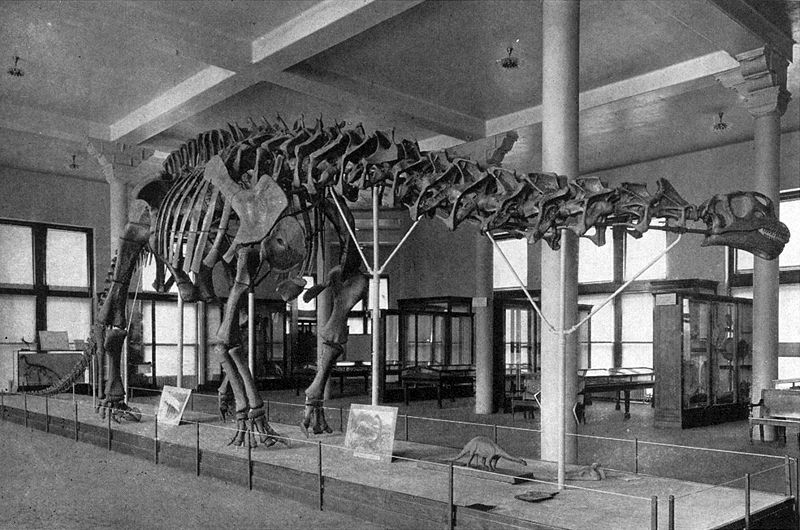 Brontosaurus (but later Apatosaurus, and now brontosaurus again) skeleton displayed with the wrong head. How can this be? I know, I know, because when I attended elementary school in the 1980’s, Brontosaurus featured prominently in my science books. And the name was featured in museums up until the 1970’s, when paleontologists discovered the head Marsh had placed on his original “Brontosaurus” actually belonged to yet another species. And again, Cope was laughing in Heaven. Even the US postal service got itself into a heap of trouble when as recently as 1989 it issued a series of stamps featuring popular dinosaurs, including Tyrannosaurus, Stegosaurus, Pteranodon, and Brontosaurus. To be fair, though, the USPS was probably using an elementary school science textbook as a reference. So why did the name persist for so long? Well, according to Matt Lamanna, paleontologist and curator at the Carnegie Museum of Natural History, Brontosaurus is just a really cool name. It means “thunder lizard,” evoking the ominous thumping and quaking at the creature’s approach. In contrast, Apatosaur means “deceptive lizard,” which I guess evokes the desire for the creature to pose as a different species so it can go by a cooler name. Personally, I miss the brontosaurus. Or at least I did. Because earlier this week a team of researchers from the Nova University of Lisbon in Portugal revealed that a comprehensive comparative analysis of dino bones has led them to the undeniable conclusion that Brontosaurus was a separate species after all. So break out the old text books, reissue the dino stamps, and grill up some stoneage burgers, because the Thunder Lizard is back. I guess Cope didn’t get the last laugh after all. Smiling in Heaven now, the indisputable victor of the bone wars is O.C. Marsh, which is how he’s most often referred to in the literature, because it’s a much cooler name than Othniel. Fabulous story you’ve spun here. 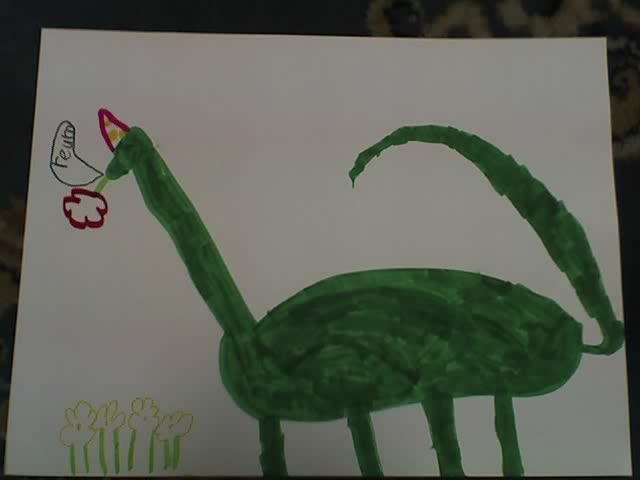 Me, I missed the whole “there’s no such thing as a brontosaurus” thing … so, in the end, I was always thinking correctly. I always did trust Fred Flintstone. Life is good! Thought you knew about thunder lizards? Read on. I love learning new stuff from you! I was never into dinosaurs but you have given me a whole new perspective on them! I am going to look on E-Bay now for Flinstone DVDs. YabaDabaDo!! Yes! More Flintstones! I realized while writing this that not only were my kids unfamiliar with Brontosaurus, but they also thought the Flintstones was just a brand of vitamins. So sad. Very interesting stuff, Sarah. I’m in the same camp as Henry–didn’t realize how right I was even when I should have been wrong. You’re lucky. There was a Brontosaurus (at least in my science book) when I was in grade school and there wasn’t one when my boys each went through dinosaur phases. I think it made them a little smug that dear old mom was so out of touch. Now I can tell them “I told you so.” Not that it will convince them their dear old mom isn’t out of touch. They’re now in the phase in which they’re going to think that no matter what.